Taste test: These were pretty good ketchup chips. Yum Yum's conventionally cooked potato chips are very crisp, crunchy and tasty. 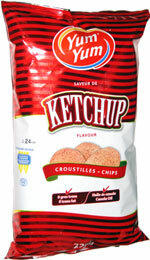 And the ketchup flavoring on these was just ketchupy enough and quite good, with a nice mix of tomato and vinegar. The bright red flavoring was pretty dramatic on some of the chips. Smell test: Mild ketchup smell.